Not only do our smart home technology solutions cost much less than you may imagine, but by working with Pro Install AV, you or your end-customers will actually enjoy long-term savings for years to come. How? With energy efficient smart home solutions which reduce the long-term cost of energy bills whilst simultaneously offering homeowners access to world class technology from our partners at Crestron, Lutron, and Control4. Along with London home automation installations, our skilled engineers can also provide full home cinema design and multi-room audio visual installations, each one fully tailored to add a touch of luxury to your projects. With quick, one-click control of your entire home lighting, heating, and AV systems, modern living has never been easier than with our premium quality smart home solutions. Can you imagine living in a home with a in-built intelligent heating system, one which knows the optimum temperature for each room and regulates itself accordingly, without you having to do a thing? Can you imagine mum and dad catching up on their favourite shows in one room, big brother indulging in the latest blockbuster game in another, and sister listening to the Top 40 on the radio in a third. Can you picture all of this being controlled directly from a smartphone, tablet, or remote control? 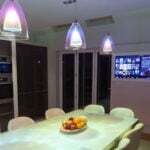 How about living in a property where intelligent lighting systems not only make your home look stunning at all times, but which ultimately result in exceptionally low energy bills? With Pro Install AV, this kind of dream home doesn’t have to be a fantasy. Whether you’re building your own home or looking to add value to your new build project, our complete home automation systems allow homeowners to save on energy bills, reduce the environmental impact of their property, and enjoy the ultimate in multi-room entertainment, all at the click of a button. To discuss adding intelligent home automation design into your new build property, talk to Pro Install AV today on +44(0)20 7096 0078.